Sun ripened tomatoes blended with onion, garlic and Tui Beer of course! We were introduced to Tuimato on a visit to Australia which included an extra Easter trip to meet some old friends. We travelled 500 km south from Sydney and friends travelled a similar distance up from Melbourne to meet half-way. OK, no big deal for you Aussies and Kiwis, but quite an adventure for two old UK pensioners who usually only get as far as the end of the road. Our friend, Barry, a jovial but barmy Irishman produced his Tuimato (sent regularly to Melbourne by his mother-in-law). 'Couldn't possibly eat a bacon roll with this' he said. What could be so special about a tomato sauce that had to travel enormous distances just to please a half-mad bacon loving Irishman? We soon found out! What a fantastic product. We're hooked. Ordered some immediately from Sanza and it was waiting for us when we got back to the UK. (Very reasonable delivery charge was a surprise too). So, a long story with a simple message. WE LOVE TUIMATO. Oh, and Barry, I'm really sorry I caught the biggest fish. Found this beauty when I was visiting my friend in NZ this year. Absolutely the best on a bacon sanger. 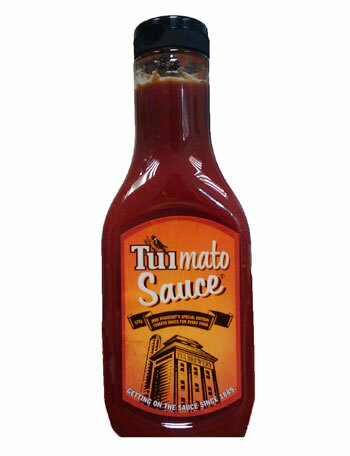 I used to be a Watties girl until my brother introduced me to this fantastic tommy sauce the last time I was in NZ. It's made with Tui's beer and although it doesn't taste like it has beer in it, it's definitely a cut above regular tomato sauce. Makes a good alternative dip as well . My Welsh husband is a big fan too!